Charting a path forward in the face of uncertainty, adopting a systems approach and proving true stakeholder engagement to better assess impacts of run-of-river projects set in developing countries. Since 2012 ESSA has completed work assessing run-of-river hydro projects in Panama, Nepal and Nicaragua. 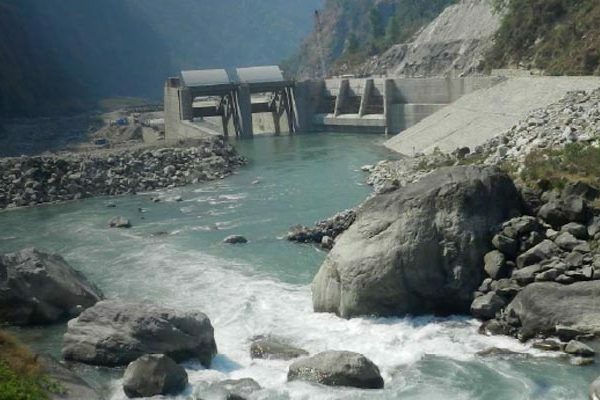 Unlike our work in the North American sphere, where an extensive knowledge base surrounds the upstream and downstream effects of hydro projects, assessing run-of-river projects in developing countries present a unique set of challenges that we ably address for clients. Thanks to our expertise in adaptive management, stakeholder engagement, and our application of systems thinking, we are able to help our clients move forward in the face of such uncertainties rather than remain bogged down in the knowledge gaps. Run-of-river energy technology is rapidly expanding in developing countries with high hydropower potential such as Nepal, Central America and the Amazon basin. 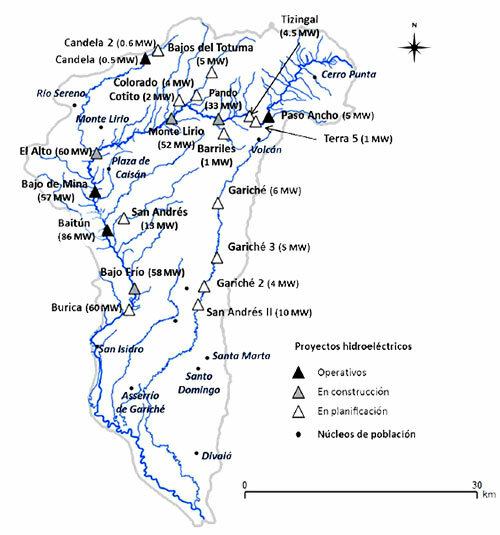 A map of existing, in construction, or planned hydroelectric projects in the Chiriqui Viejo Watershed, Panama, as of 2014. This map illustrates the potential cumulative impacts in nations with little regulation around cumulative effects. These watersheds are often characterized by rugged terrain, and their rivers and streams have steep slopes, providing a high potential for hydroelectric generation. These areas are usually rural, and sparsely populated. Similarly these watersheds are prone to ecological and socio-economic cumulative impacts as the existing projects and proposed projects in the watershed often have an overlap their upstream and downstream impacts and with other development pressures. Often, the rapid pace of development means that many projects are being proposed and developed in the same watershed without consideration for cumulative assessments given a weak national regulatory environment. Plus data and knowledge about the potentially affected terrestrial and aquatic habitat is very limited. That’s where we come in. We provide an independent and rigorous environmental assessment of these projects within the context of limited information and evidence and advise our clients on how to fill in those key knowledge gaps. We adapt and transfer our experience on hydro projects in North America to a developing country context. How to address the scientific and ecological uncertainties. Uncertainty is a tricky thing in any environmental assessment, and nowhere is this more true than in remote areas of developing countries. Managers in developing nations must be able to act despite little or no baseline data, a paucity of credible scientific information on ecosystems and also many unknowns surrounding the valued environmental and social components of local watersheds. Monitoring of flows and water levels against a gauge along a river affected by a hydroelectric project in the Yaoska Watershed in Northeast Nicaragua. 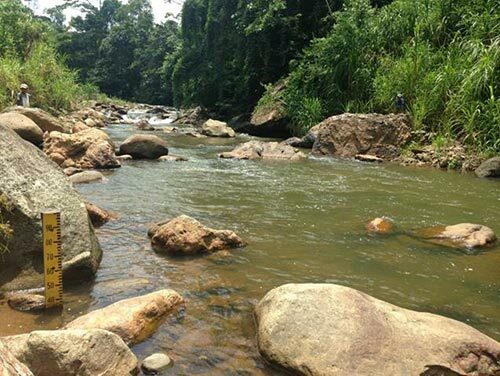 One great example of the type of solution we provide our clients is with our work in the Yaoska Watershed in Northeast Nicaragua, where we led the environmental impact assessment, including a preliminary assessment of environmental flow needs to figure out just how much water the river needed. In this case, the project included five small run-of-river facilities all on the same watershed. It was impossible to know how the river’s aquatic habitats would respond to the project. We advised our client to take advantage of their multiple facilities and to operate them differently to assess the downstream risks of altered environmental flows. That contrast in environmental flow regimes over the long term would provide the client with the information they needed on the impacts of different strategies. ESSA assessed disaster risks to infrastructure through a national multi-hazard study on existing infrastructure of strategic, economic and social importance to the country. The study modelled almost 100 different hazard scenarios (from landslides, flooding, tsunamis, and earthquakes to volcanic activity) and the physical vulnerability of seven infrastructure categories including: major roads, highway bridges, transmission towers, electrical sub-stations, water and sewer infrastructure, schools and healthcare facilities. Our study concluded that the total average annual loss (a common risk metric that represents the expected loss per year averaged over many years) for infrastructure studied came to $35.5 million. 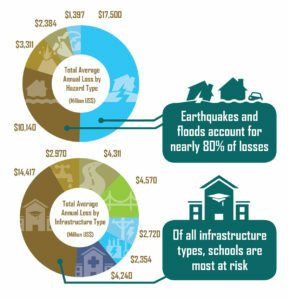 Earthquakes and floods were by far the most destructive, accounting for 80% of those financial losses. The study also mapped natural hazards across the country to produce a hazard atlas that will prove critical to land use planning and development decisions going forward. The natural hazard risk analysis we provided the Salvadorian government has armed them with the information they need to help prioritize infrastructure reinforcements and retrofits and make decisions on local infrastructure planning. 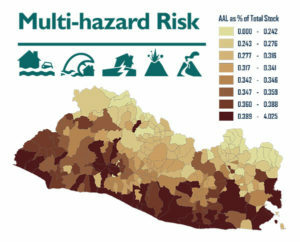 An example of a hazard risk map produced for El Salvador as part of this project, showing in this case the total average annual loss (AAL) for Healthcare Facilities to natural hazards, by municipality and expressed as a percentage of total stock. A subsequent series of case studies provided more comprehensive metrics for natural hazard risks beyond simple replacement costs of infrastructure, analyzing the direct, indirect, induced and macroeconomic costs to El Salvador of infrastructure loss and damage. An overview of average annual losses (AAL) in El Salvador for seven infrastructure categories studied through modelling of numerous hazard scenarios, which add up to roughly $35.5 million per year. A second component to our work in El Salvador involved strengthening institutional capacity with respect to incorporating climate change into EIAs. Before the project started, EIA reviewers at MARN noted the need to understand how the impacts of climate change might affect a project or how the combined effects of the project and climate change might affect valued ecosystem components, or whether the project might be a high emitter of greenhouse gases. However, MARN lacked clear requirements and tools to ask proponents to account for climate change in a systematic way. We looked at the EIA process to identify entry points for including information on climate change impacts, adaptation, greenhouse gas emissions and mitigation, and based on those entry points develop tools to help integrate information about climate change into steps in the process. Further to that we also helped to develop non-expert screening and monitoring tools for MARN. These included: climate change screening criteria and indicators for initial environmental review; an operational guidance document on the integration of climate change considerations in project-level EA; and a toolkit for review and follow up by MARN. We also delivered a capacity training program that helped to ensure the MARN staff were well versed in how to use their three climate-integrated tools. By the end of the two-year project, we delivered 124 hours of training and facilitation. We brought 47 of MARN’s staff up to speed on the basic causes, effects and actions of climate change, we introduced 43 individuals from public-sector project proponents to MARN’s initiative to integrate climate change in EIA, and helped lead 16 technical specialists within MARN and other government agencies to apply our 150-page EIA guidance note to three existing EIAs for projects that had already received permits.